Physical Chronically overweight since childhood. May be obese. Round face. May be near average weight with exercise. Emotional Either highly social, jolly and cheerful, or sluggish, depressed and hungry. Gets satisfaction from eating. Social Enjoy food shopping, preparation eating and entertainment, preferably with supportive family or community. Mental Survival intelligence. Focus on filling the needs of self, others and the community. Ranges from quite intelligent to forgetful, depending on secondary type. May get caught in an unhealthy cycle of dieting and binging, with ever more weight gain over time. The pancreas gland, located beneath the rib cage, secrets digestive juices into the intestines and produces hormones that control blood sugar levels and fat storage. Insulin causes sugar to be stored in fat cells. Insulin overproduction leads to obesity or chronic weight-gain, and under-production leads to diabetes. The hormone glucagon releases sugar from fat cells and from the liver. The pancreas also secretes somatostatin, which inhibits growth hormone, insulin, and glucagon. 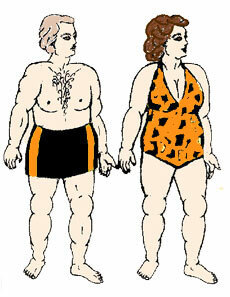 Gut hormones and fat-cell hormones like leptin also affect appetite and blood sugar.